I disliked it the first time, finding it tedious and struggled my way through it for most of my school years. I had to work hard at it. For someone who had a sharp perception in every other area, I was not used to this kind of struggle. Had I known I’d have to go through it a second time I would have paid more attention the first time round. Fact is that I was so happy to skim through it, I never bothered looking back … or forward. This weekend I felt like slapping my head against the desk again. Thoughts of hours spent slaving away, agonizing over problems and scrutinizing solutions came rushing back to me when I saw Soeren’s exasperated expression as we tackled … 5th Grade Math! Unfortunately, it seems he has inherited my weak Math gene … instead of acquiring the ingenious genes of his father, who I might add just for the purpose of stressing my point, is a brilliant PHD structural/geotechnical engineer. Seems my genes were more resistant and fought hard to assimilate any stressy Math chromosomes that entered within a meter of the developing brain. Instead, Soeren is a talented linguist, languages are grasped and spoken easily. He shines when he picks up the guitar, working the chords easily and he is quick and efficient in sports, running and swimming for his teams. As all his teachers, from preschool to 5th Grade have told me “if he focuses this much more … he would be brilliant!” Those exact words were written in my reports by many teachers. There is no denying he is my son! We sit across each other with books and papers scattered all over the big dinner table, heads steaming, parched throats, faces red from frustration. We’re tackling conversions and I am explaining how to easily convert milliliters into liters and back, grams into kilograms into tons, seconds in hours in days. We are adding, subtracting dividing and multiplying tons to kilograms, decimeters to meters and after what seems like the most exhaustive 2 hours of my life all I am hearing in my brain is static. A pot pie is typically American and will generally have a filling of meat or poultry and vegetables. These pies usually encase the filling completely in a flaky crust, where the base and a top hold the meat and vegetable filling inside. In Britain a pot pie would simply be called a pie! This pot pie fuses the best of the US, UK and Germany. 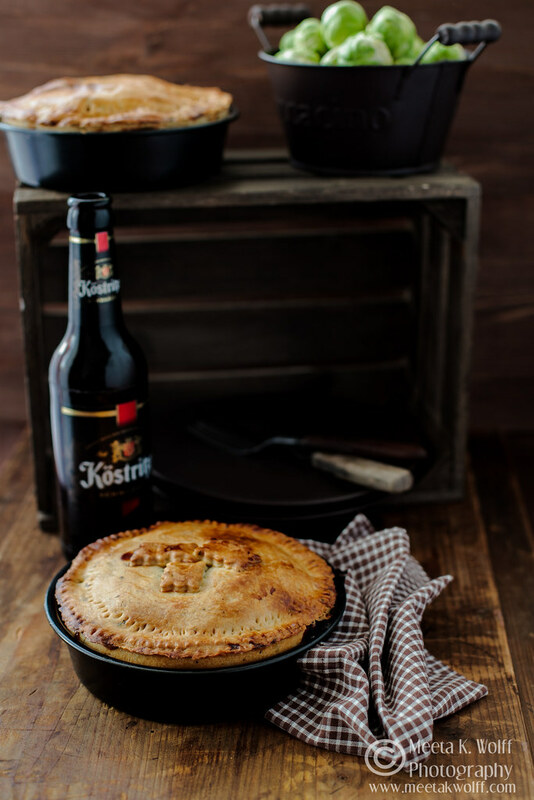 I took the British classic beef and ale pie, substituted the ale for a good German Köstrizer Schwarzbier and encased the divine meaty filling in a pastry speckled with handful of mixed herbs. Cook, style, shoot and eat - the Supperclub | Food Styling and Photography Workshop in London, together with the talented Sumayya, on 15 & 16 February 2013 promises to be a full food experience for all foodies attending the workshop. It will be a hands-on food styling/photography workshop lead by me, a session on overcoming the challenges of restaurant and low-light photography by Jeanne as well as a culinary tour led by Sumayya where participants will learn different cooking techniques used in the Indian/Pakistani kitchen, create some mouth-watering dishes, and indulge in an array tantalizing South-Asian street food. The main venue is the stunning kitchen at the Central Street Cookery School, which provides huge windows for gorgeous natural light as well as plenty of space for cooking, styling, photographing and eating; and we will also be dining at a gastropub so as to practice the low-light photography skills. Have I awakened your interest? Register for your place on this workshop now. I am totally thrilled to see many delegates sign up from Germany! You guys are making my day. The workshop is limited to a max. of 12 participants and we have a few spaces available. Roll out remaining pastry to a thick round, which is big enough to cover the pie dish. Brush the edges of the pastry in the dish with egg, then cover with the pastry lid. Trim the edges, crimp the pastry sealing it well. Brush the top heavily with egg. Make a few little slits in the center of the pie, place on a baking tray, then bake for 40 minutes until golden. The stew is simmered gently 2 hours in the oven, which allows the flavors to intermingle with each other slowly. The meat remains beautifully succulent and juicy and the malty aroma from the beer adds a special touch to the stew. Do not miss out on the adding the dried porcini as this really gives the entire dish such a powerful rustic flavor. Together with the flaky, buttery and herby pastry this pot pie is just perfect for cold winter days offering comfort and satisfaction in each bite. Pot pies was also the theme for the Monthly Mingle this month hosted over at Susan Wolfe of The Well-Seasoned Chef. I was thrilled to have Susan host the November issue and I am looking forward to all the great submissions. If you would like to join us the deadline in 30th November - just a few days but it would be great to have you over to our party. Love the idea of herbs in the pastry. 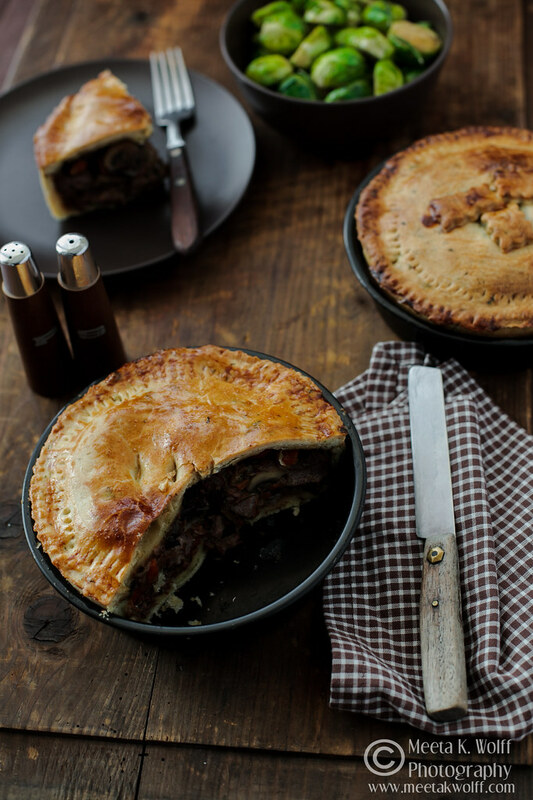 I adore a good pie - steak and mushroom is just about my favourite (apart from the custard type of course). As for maths, well you know about the lack of that gene in my make up...! I love adding flavors (spices, herbs or ground nuts) to the dough. It adds an additional level to the dish. I knew you were the type for a good pie. on the contrary Maths was one of the few subjects that didn't scare me :) beautiful pie Meeta! Ahh! Well we all tick differently. I much rather preferred my French and English literature classes and would have rather been deep in a plot or poem than algebra or arithmetic! This pie is splendid and really inviting! Comfort food at its best. Your pictures are awesome! My favorite so far. HA! Well I am beginning to have those nightmares again as I sit with Soeren helping him do his Math! Thanks for the kinds words Rosa! mmmm that pie sounds like something I would like to eat and soon too! My dear, you have a teacher gene, I guess! I have to love out loud, it sounds so funny but I know it is really appalling - I have a weak math gene too and during studying psychology it was all about maths and statistical stuff - never ending nightmares! Thank god it's over! What a great cross-over recipe - I like beer and beef but never made a potpie, should give it a try. And what should I say - in love with your moody pictures too. The truth is that i do the whole finances for my institute here and think .. if only my teachers could see me know! HAHA! Maths - ugh! Well, no - i actually like arithmetic, it's the stuff that came later with quadratic equations and algebra later that I did not take to... 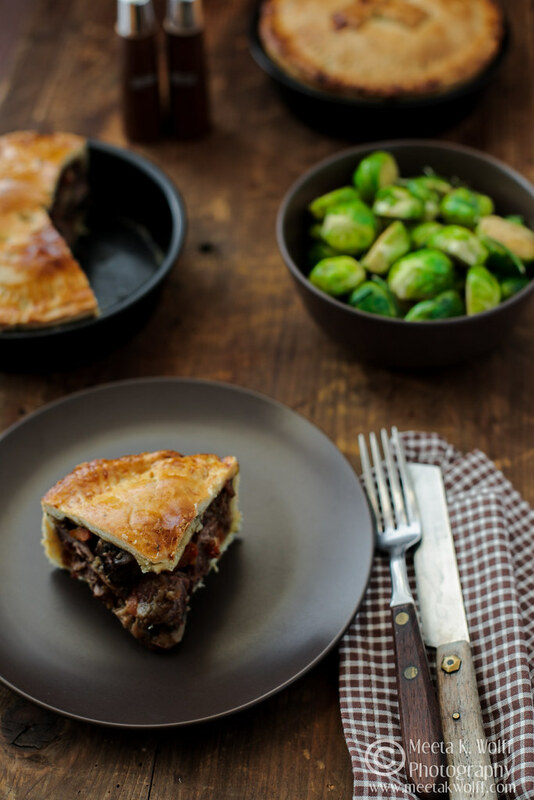 I do love a good pie and also make a guinness and beef pie similar to this (although I cheat and put just a pastry lid on the top of a dish of stew LOL! True comfort food. I think that is where I shall dropout when Soeren comes home with that! UGH! I liked the idea of encasing the whole stew in pastry- Always something extra comfy about flaky pastry! Oh, I hear you Meeta. I am a liberal arts guru all the way surrounded by three math/science loving family members. The kids go to a private math science school. That is all they teach. They love it. I handle the painstaking task of homeschooling grammar, composition, history, languages...and anything related to business (which I do love). I get utterly tickled when I pick out a documentary about British history or a social documentary and they want to watch mythbusters or 'how it is made'. I hear you! Can you pass the math on to your husband?? At about eighth grade I gave up and my husband felt so good about being part of our 'homeschool' endeavor! I've always admired you for your homeschooling Sarah! i think that is something I just could not do. Like you I loved History, Geography languages and literature. I fear that 8th Grade is where I'll be giving up too! GORGEOUS, Meeta! So pretty for such a hearty dish. I always drool over your photos! Thanks Kristy! It was a great dish! Oh god, this story just scared me! I have had nightmares with floating numbers spitting fire, as child. I cannot tackle another math problem in my life. Now can only cross my fingers and hope that my little one only got her father's looks but his love for math and science too! HA! Prerna - we all have to go through it I guess. I can only advice you as a young mother - start brushing up on those Math stuff now! Lovely photos! The pastry looks so golden and flakey. Adding herbs is such a great idea. I will try that next time. Thanks Stephanie! Yes adding herbs to the pastry is great. I rounds the dish off perfectly! Loved your description of the math...I suffer from this affliction myself! Fabulous that your son excels in so many other areas. Beautiful recipe and the photos are incredible Meeta! Yes he certainly did inherit many of my genes ... I hope he can beat the weak Math gene though HAHA! Splendid and comforting pie. Lovely pics. Loved how you described math though it was one of my favorites in school. Always thought those who said that were lying a bit. Never understood how Math could be anyone's favorite subject LOL! I used to enjoy math a lot but I doubt I can deal with it again in future !! Love the pie and the set up. Well if you have kids you might have to tackle it again ;o) Thanks for the comment! I did well in math, but my feelings about it were neutral at best, much preferring the arts. Your pie, Meeta, is a work of art, and a wonderful contribution to Monthly Mingle - in a word: "Brilliant." Susan, oh in the end I did well too. I had to struggle for it though! That was the difficult part. Glad you liked this! Clever you are! Yes this really is a great dish for the holidays and entertaining. The stew was incredibly hearty and flavorful. Enjoy! This pie looks incredible. The richness of the hue is so rich. Love that you infused so many cultures. BTW I loved math though my math brain cells now are dull! I am sure they can be easily freshened up Shulie! Thanks for the comment! Meeta, this pie looks absolutely incredible. I especially love the sound of the herbed crust. What a great idea to add some herbs to the pastry. Although I never really battled with maths I was very bored with it!! The pie looks amazing and your pics are so pretty, as always! Your pie looks so homey and wonderful...the beer makes it even look better!